I might have mentioned recently (or about a million times recently) that I switched over to Trello to keep track of my projects and tasks. So when Patsy from the Womagwriter’s Blog asked me to do a guest post on tracking projects and submissions, I decided to share some more info on how Trello works and why that works better than something like Excel. You can check it out here, if you’re curious. On Friday, I mentioned that I finally, after almost a year, figured out my content strategy for this blog. Honestly, it wasn’t a minute too soon. I’d been feeling like I just lost steam after my disastrous year in 2014, and my blog got lost with it. Sure, there are some of you die-hards (thank you!) who kept showing up and saying hi, but I definitely noticed a dip in my traffic. And to be honest, I really don’t blame those of you who fell away. Why? Because while I occasionally happened to post something that I felt was worth reading, it was mostly a reactionary, almost spontaneous process. Some things hit, some things missed. And because I was constantly behind on literally everything, I never knew what I wanted to write about most of the time. My YouTube channel, incidentally, suffered from the same thing. I enjoyed writing for both this blog and for my channel, but often, I’d be at a loss and spending way too much time on figuring out what I wanted to write about. As a result, I more often than not ended up skipping altogether. Because let’s face it. While blogging is awesome, it can’t (and won’t) be my priority. It will always come second to my books and job. I’m not one to give up, and when I saw this book by Meera Kothand, it seemed like my blogging muse was telling me something. 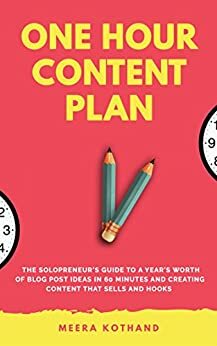 The One Hour Content Plan is mostly aimed at bloggers who actually want to directly earn money from their blogging, as opposed to only partially augmenting my other earning activities. That said, I found this book invaluable simply because it put what I was trying to achieve into perspective. And that perspective helped me realize why I had felt that my blogging last year was unfulfilling both to me and to the readers. I was aiming at the wrong people. For example, I would share my YouTube posts here, and you guys would be completely unenthusiastic about it. And I didn’t really get it, because the content on my channels was the exact same thing I had been writing about basically since I came to blogging in 2010. But that’s what I realized. Many of you guys have been with me since 2010 (THANK YOU! ), but you, like me, are not the same people you were back then. We grew. We gained experience. We’ve learned lessons. We’ve become better at what we do. And if I write something that’s about “how to write a book,” 90% of my audience here won’t care, because 90% of you guys already wrote at least one book already. So I could revamp my blog and change everything to recycle my audience and attract more new writers, but I happen to like you guys and I want you to stick around. Here’s the thing, though, those kinds of posts are not the ones that are popular on my YouTube channel. So I’m going to split the two. My blog will be bringing you the content I think will be the most relevant to you guys, and my YouTube Channel will be aimed at readers and new writers looking for advice from an old veteran. Advice on Goal Setting, Time Management, etc. Lessons and thoughts I have regarding writing, editing, the industry, etc. Advice and opinions on the business end of being a writer. And then, because I enjoy doing it and would like to do more of it, I would like to regularly share some more graphic-design-y things I’ve been doing. I really hope that you guys will be as excited by these changes as I am about making them. If you have any thoughts, comments, or blog topic suggestions, please do leave them in the comments section below! I will definitely take a look. So what would you like for me to write about? Yes, I do have a plan, but the plan is flexible, so I’m always game to address something if you want me to. It’s the last Friday of the month, which means it’s time to update everyone on my goals as part of the Got Goals? Bloghop. For those of you who don’t know what I’m talking about, JEN Garrett and I host a monthly bloghop where we set crazy or just crazy important goals, and then post regular updates on our progress on the last Friday of every month. You’re welcome to join. Just click here and follow the instructions. I have to say, for someone who didn’t set any official goals for the month, I actually did great. Despite the fact that there were some bad stuff that happened to rock the boat, I still managed to float enough to get some of my goals done, including some of the big year-goals I set for 2018. The major headline is that I had a record month in January, making more than $200 more than I did in December. I didn’t quite make it to the number I’d hoped for, as things just fell quiet towards the middle of the month. But that was also good in its own way, as I could then devote more time to Book 3, which I really do need to publish if I’m to achieve my goal of making more money from my own writing. Although it was impossible for me to spend time on my work on some days, I did manage to catch up on the days where I could work on my own stuff to the point where I spent an average of 38 minutes every day on it. This means that I got through 20 chapters (out of 85) of my revision to Book 3 and I managed to write a poem as well. The major bit of news here is that I figured out my content strategy, both for my blog and for my YouTube Channel. I’ll write more about this on Monday, since I don’t want to make this post too long, but suffice it to say, I basically have an entire year’s content (and back-up content) planned out for both. I’m hoping that not having to sit down and figure out what I need to write about will help me make more efficient use of my time, and to be more active overall. I can’t really say I achieved anything here, but I can officially say that I’m actively working on my health now. The major change I made is to get more serious about my water consumption. It’s seriously hot here at the moment, and even the slightest dehydration can have bad effects not only on my health, but on my writing as well. For example, if I get a headache because I’m thirsty, it doesn’t take much for that to turn into a migraine that puts me out of commission for at least a day or two. The nice side-effect is that drinking more water has made me less hungry, which means I’ve been able to improve my food choices and portions. It’s also given me a bit more energy, which means it became an almost natural progression for me to start exercising. Which is important when you’d otherwise spend your whole life in a chair, y’all. What Do I Want to Achieve in February? To keep things simple, I’m going to pick five goals that are important to me, so I can prioritize them over the other things I want to do. 1) I want to finish this revision round of Book 3 by month end, if I can. 2) I want to make a final decision with regards to whether I’m going to use my old system of CPs for each round of edits after this point, or hire an editor. 4) Maintain and further improve the healthy habits I’ve started to establish in January. 5) Read for an average of 15 minutes per day. How did January go for you guys? Any progress on your goals? I’ve finally managed to sit down and evaluate what I’m doing with my social networking, but steering everything in the right direction is taking a bit longer than I would have liked, so I will be quiet until Friday, when it’ll be time for another Update Day. This week, I’ve been thinking a lot about framing. 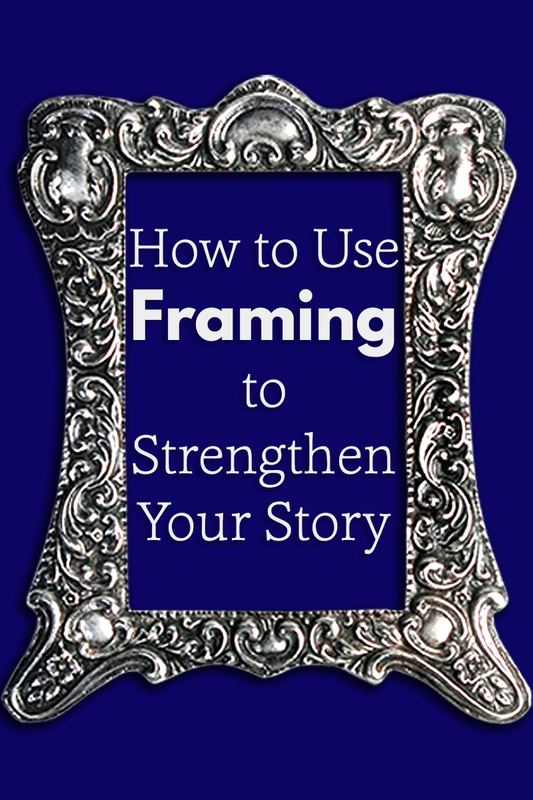 A lot of us take framing for granted, but it’s actually such a vital part of our writing. So I thought I’d talk about it today. We often think of framing in terms of the plot frame. As in how a plot forms the backbone or frame over which the whole story goes. This is true, and as important, but what I’m thinking of is framing, almost in a photographic sense. When we write, we should be framing the chapters in the same way. See, a chapter isn’t just a number with text after it. It’s actually a snapshot out of your story, and like a photo, the best chapters are framed properly, so the contents do the best work possible toward progressing the plot. Since I’ve started freelance editing, I’ve been noticing quite often that writers seem to think that chapters should just begin and end, maybe at a set number of pages. Many writers seem to think that, as long as the story gets told, it doesn’t matter where the chapters start and finish. In a way, they’re not wrong. Beautifully framed chapters won’t do anything if the story is weak, but then, I don’t really think you can beautifully frame chapters if you didn’t sort your story out first. The thing is, the framing of one’s chapters can be the difference between a good book and an excellent one. Or even an okay book and a good one. It all comes back to reader immersion. See, readers have been trained to “read” certain things in a certain way. For example, a comma makes them pause. Periods make them pause longer. Line breaks mean there has been a change of some sort from one paragraph to the next, whether it’s in location, time, or point of view character. The readers might not yet know what changed, but that line break signals them to be prepared for it, so when the change does become apparent, they’re not pulled out of the story. Just so, readers are trained to read something into a chapter as well. A chapter is a unit, which follows after the previous one and goes in before the next. The end of the chapter means that the main content of said chapter has been dealt with. Even chapters with cliffhangers. There is obviously still something unresolved in that chapter, but something still happened, and progress of some sort has been made. They probably won’t even be able to lay their finger on the reason, but more often than not, that sense of writing being off comes either from pacing or framing problems. (And pacing could be a framing problem in itself.) If chapters aren’t framed nicely, your job of lulling the reader into staying immersed in a story becomes that much harder. So what are the signs of bad chapter framing? The chapter doesn’t lead in. By this, I mean that writers open chapters in the middle of nowhere, giving readers no sense of where the characters are, what’s going on, who’s involved, or even who’s there (which especially becomes an issue when we’re dealing with larger casts). Unless the chapter follows directly on the previous one (but not too directly, more on this later), make sure your reader can paint a picture in their mind’s eye of what’s going on before anything important happens. You don’t want your scenes to look like they’re happening in white mist. You don’t want talking heads. And you don’t want the reader to exclaim “where the heck did he/she/it come from just now? !” Because all these will pull your readers out of the story. Nothing happens in the chapter. This is a common one with writers using flashbacks. Usually, your main plot is the one taking place in the present. That’s the plot you want to progress. If you only have a paragraph of two of a character starting to reminisce, followed by the flashback scene and nothing else, nothing has happened in your chapter. Because even if the memory is fully action packed, your character did nothing in the now while they were remembering the past. This isn’t to say that there has to be action in the present all the time, but something does need to happen before the chapter plays out. So does the flashback cause a reaction? Does it cause an emotional response? Does it trigger a major decision? Put those responses in the same chapter as the flashback, because in that way, the flashback adds to the main plot in a direct, immediate, meaningful way. Often, this goes hand in hand with the previous point, but whereas nothing happens in that example, this one is more a case of a chapter ending just as something interesting starts to happen. I’m not talking about cliffhangers here. This is something entirely different. Chapters, like most plots, have a beginning, middle, and end. Something is introduced, something happens, and there’s a resolution. I find, sometimes, that something will be introduced. Yeah. Did you just get the feeling that I just left you hanging out to dry with that sentence? That’s exactly what an abruptly ended chapter feels like. The reader knows there should be something coming after, but it’s just not there. The blank space where the chapter ended becomes a gaping vacuum in your story. A good example of this is a big revelation or admission by a character, and having that revelation be the chapter’s end. This could work as a cliffhanger, but nothing else has happened in the chapter yet. This is bad enough, but when I turn the page, I find that the new chapter doesn’t continue where the last one left off. So… what? Did the writer forget to finish it? Did he/she just not feel like writing that day….? Takeaway here… write out your scenes, people. Its not the readers’ job to fill in the blanks for you. And then we ease them into the chapter proper, where things are happening. The problem is that we sometimes overdo it. We gloss over too much, and important parts of the story as a whole get lost. It’s not cool to tell me a character became friends with another one without showing us as it happens. Sure, it’s cool to save the reader from the boring parts, but some things, like growing relationships, discoveries that have bearing on the scene now… those sorts of things… we want to see. If you have to say “so this cool/interesting/important thing happened off-screen,” it really means you’re excluding the readers from your story, which means they’ll no longer want to stay as immersed as they have been. The chapter ends for no reason. As I mentioned before, a chapter has a beginning, a middle, and an end, and if you split the chapter in two for no reason, it just ends the one chapter abruptly, and starts the next in the middle of nowhere. Obviously, cliffhangers are the exception, but the reason why they exist is to create tension. That said, there are so many ways in which cliffhangers can be done wrong. Honestly, I’m not a particular fan of the cliffhanger chapter ending. I don’t hate it. I mean, it’s still as good a writing tool as any. But more often than not, writers use them wrong, in some groan-inducing ways. One more thought. If you’re writing a book with multiple points of view, it’s probably not a good idea to use a cliffhanger chapter ending if it’s going to tempt the reader even a little to skim over, or entirely skip, the other characters’ points of view until the cliffhanger’s resolved. Chapters are too long or too short. This is where pacing comes in. As I mentioned before, readers read chapters as units of a story. But further than that, the speed at which a reader gets through those units influences their concept of the book’s pacing. Shorter chapters=faster pacing, longer chapters=slower pacing. So what happens if you have a whole bunch of long chapters with one thing happening after the other in quick succession? It feels wrong, because the chapter rate clashes with the story’s actual pacing. Just so, too many short chapters will jar if your overall story unfolds at a slower rate. In such a case, it might be a good idea to look for this specifically, and combine or split chapters accordingly. Framing your chapters is a subtle art. So subtle, in fact, that most people completely forget to do it, but most framing issues are simply solved. All it takes is adjusting the aim and focus of your chapter ever-so-slightly. Can you think of any other ways for chapters to be framed wrong? Any of my examples a pet peeve of yours? Sorry for the radio silence. I’ve basically got hired for a big job on the Thursday after IWSG and today is the first day where I wasn’t either on the job, or recovering from the job. 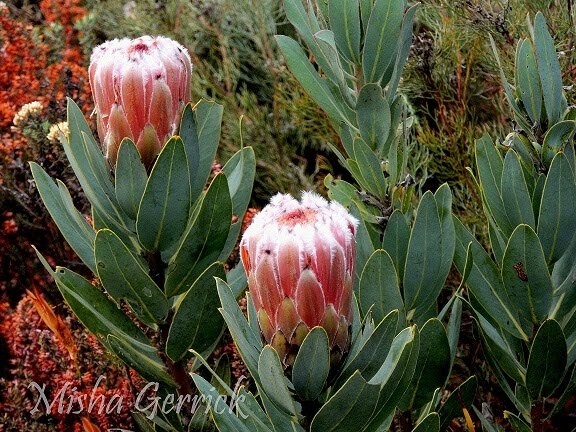 But while I was away working, an interview I did on freelancing went live on Ronel the Mythmaker’s Blog, so if you guys are interested in that aspect of my career, please do head over and say hi. If everything goes smoothly, I should be back on Friday. Insecure Writer’s Support Group: …….. Already?! The Insecure Writer’s Support Group is a monthly bloghop where writers can share their doubts, fears and insecurities with each other. It’s a nice way to vent, but also to realize you’re not alone. If you’d like to sign up, click here. You know, you’d think that starting fresh for the New Year would leave me fresh and renewed and at least a little less insecure than usual, but alas… No. Namely, the sheer staggering amount of items I have on my to-do list. Except this year is worse. Why? Last year, I kept track of my list with a diary and pens, which meant that I had at most 20 tasks on a given day. But I switched to Trello last year, which is the same thing, except digital, which means I can set myself an unlimited amount of tasks. And it seems like my life has taken it upon itself to meet that challenge. On January 1st, I cleaned up all my lists, starting from scratch with only my goals as a starting point. Then I started adding the little tasks I have to do from day to day. And added… and added. And in two days, my list of things I need to do today shot up from 0 to 30. Count them. 30 items. To be fair, I can shift a lot of them out to other days, but for some reason, I’m just not getting to the ones I deem to be essential, like having to spend at least 20 minutes today on editing my book. I literally can’t figure out where I’m going to squish that in yet. And this is supposed to be a day off. How are you doing? Do you also feel like 2018 is starting like an avalanche?